RP is fun and everything, but we can't exactly do anything to semi-sane levels without everyone having some semblance of parity with each other. With the current space setting as well, we need to hammer out where everyone actually is. It's been years since the Union of Gold and Silver. Under the direction of Skyla 'the Morning Star' and Silver Ruse, as well as a bit of cheating with time travel, the Imperium has spread itself amongst the stars. Other than an awkward meeting with several other universes before the Union, the Imperium has yet to meet another space-faring civilization. For now, the Imperium is content to focus inwards, settling worlds and dealing with the various incidents its vassals have caused over the years. Welcome to Equestria, where there's an apocalypse every Tuesday. Excitement and danger await throughout the stars. One just has to step outside the door. Skyla and Ruse's reign has seen massive shifts in the Imperium's very nature during their current reign. What was once a purely pony dominated state was turned into a mongrel child born of many fathers. With FTL technology ripped from the carcasses of some other universe's ships, population made of radically distinct groups, and a vampire alicorn empress at the helm, the Imperium through luck and effort has managed to dominate the stars. However, with that growth comes cost. While the systems near Equus have seen the Imperial fabric being successfully woven from its diverse threads, the ones outside are a hotbed of conflict. Eilodons, consisting of various western fantasy races, the Gen'ei, composed of the youkai that came with Gensokyo's annexation into the Imperium, and Equestrians, the ponies and changelings that were already there, fight against each other in a deadly dance of intrigue, magic, and plasma shot. And that doesn't even include the interfaction fighting, such as the Gen'ei religious conflict or the Eilodon's dwarven-elven rivalry. With all the problems bound to come up with contact with other nations, can the Imperium forge together its disparate population, or will it be torn up as the galaxy is once again covered in storm? The people of Armetesia barely escaped the flare that destroyed their homeworld. The galaxy thought that the country had collapsed, that the communists, anarchists and republicans would tear apart what remained of the country. Yet, on a new world, the Old Order re-emerged. The monarchy had taken power in the frontier region of the Imperium, and due to rapid internal economic growth and the nationalistic platform of the new parliamentary government, Armetesia has renewed imperial ambitions. The nation had yet to reveal itself to the galactic stage, yet it was planning on entering with a bang. The Quintolanian Empire. No, Empire is the wrong word. It implies order, rules, laws, a semblance of peace, a decent form of government. "The Land of the Eternal Flame" is not one such place. Located on an ever-expanding island somewhere in the middle of the ocean, what was once a group of warrior tribes grew into a militaristic, forward-thinking, and somewhat askew tourist hub. This was mostly due to the meteoric rise of Flamicus III, the mysterious leader of Quintolania. With Carlos at his side, he managed to civilize and industrialize an entire nation with a minimal amount of genocide (Take that, Stalin!). As of recently, most of this work has been undone. The merging of several parallel universes and copious amounts of magic gave his army commander, Ragnus, a chance to take the throne. The nation-state is in shambles. There's wars in the streets, crime is rising, and Flamicus is on the run from his own military, organized crime rings, bounty hunters, and a sect of monks dedicated to Aquaticus, a leader that he had deposed in a rather flashy coup before Ragnus's own. With the stage as shaky as it is, will Flamicus make his fiery return? Or will this leader's sun set too soon? The dazzling utopia of Our Town - or "Our City-State", or "Our Empire"; it's hard to define them when they change their name with every expansion. After Starlight Glimmer, the Prime Citizen of Our Town, was assassinated by an unknown party, the nation-state fell to chaos and internal strife. Darkest Night, her second-in-command, fled the country and set out among the stars on a prototype cruiser. Believing the Imperium murdered Starlight, he has devoted himself to causing mayhem and inciting rebellion throughout the galaxy, with the ultimate hope of overthrowing its rule. 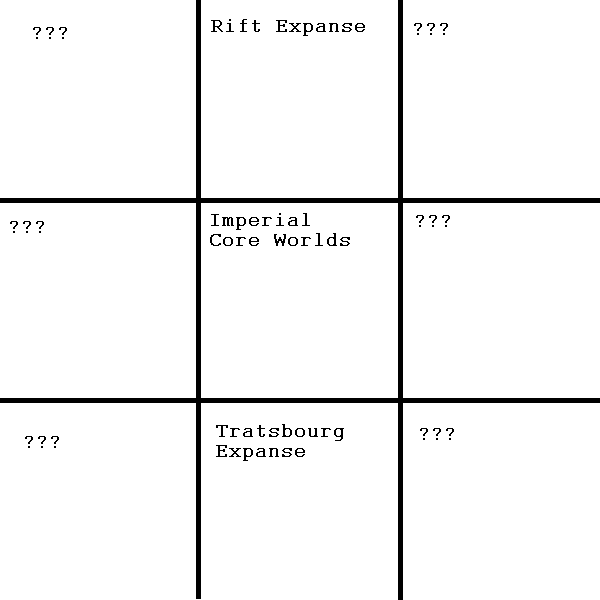 Imperial Core Worlds - Exactly what it says on the tin. The center of the growing Imperium of the Alicorns, the Core Worlds Sector is the beacon of civilization. Divided into four quadrants each controlled by different portions of the mixup of the Imperium, the place is rife with intrigue and small-scale wars. Tratsbourg Expanse - The "southern" frontier of the Imperium and the location of Armetesia. To the Imperium, the Tratsbourg Expanse is simply another front of the wars between the Equestrian and Eilodon populations of the Imperium. To Armetesia, it's a refuge after its holdings on Equus were bathed in flame. With Armetesia rising, this Expanse is about to get a lot more exciting. Rift Expanse - The "northern" frontier of the Imperium, the Rift Expanse is both named for its relative lack of stars and a mysterious rift in space-time located somewhere in the sector. For some reason, expeditions in this sector always end up in strange accidents. Wait, is this set in timeframe of Socialist or recently independent Armetesia? Alternate timeline, where Skyla did give a dowry as well as hold the wedding on Equus. You can decide whether your nation is still socialist or monarchist. Is this a place where all the nations have a chance to set up their setting? To clarify, can I put some exposition here? Yeah. Exposition, setting ideas, this place is pretty much going to be the sounding board. Untill now. Over the course of this AU-RP: Ventaions past as a whole will be slowly revealed. Where's that located so I can shove it on the map? Unless you're talking about Equus, the homeworld, which means its part of the Core. Sorry alicorns, quick side-note while you're here. If my nation is currently only making its first real forays into space, would we be located on the Home-Worlds as well? Yes. I also saved six slots on the map for anyone who wanted to claim that (and I couldn't really think of anything). When I say Equus Core, I mean the core of Equus. Latter; ventaion hightails it for a completely different galaxy once escaping the core worlds. From the one reconstructing the Imperium to basically being an authoritarian Federation made up of ponies, Touhou, changelings, and western fantasy... What? The Home World: where all of equestrian started. Ventaion has been living underground inside the planet for years and is finally ready to leave not only the solar system, but the entire galaxy. No one ever known of the underground civilization. with only 3 combat ships, a shield ship and a mother ship: they plan to make a break for it... Undetected if possible. So, is it a good time to go IC? So I guess I'll participate in this. You guys can start anytime you want. Silver Ruse, the wife of the illustrious Empress Skyla is known throughout the Imperium as the Passive Princess becuase for all what she does, is do stuff what the other politicians are doing: sit, sign stuff off, and go around kissing foals on the foreheads. Some consider her to be generally mundane, rarely does she ever do anything important or hot. However a very small minority of conspiracy theorists in the Imperium, watch her more closely. They think that her lame duck act is to cover up something. Some say she's the head in the Imperium's intelligence agency's black operations and internal security's secret law enforcers dealing with dissents with. Because of her previous connection as a CEO of a powerful, but not generally known Conexite company and active participation in economic related issues. Other theories speculate that she's abusing her position, but there's no solid evidence so far to confirm this. » Tomato not setting fruit?